At Varsity Bike & Transit we stock a select variety of electric bicycles that we are confident will fit both your riding style as well as your budget. With ten years of selling and repairing electric bicycles we have had the opportunity to see what technology works and what the future looks like for the market at large. We have done our best to keep up with the rapid pace advancements in both the battery and drive system technology and are confident in our ability to recommend a bicycle to you and keep that bike rolling with our consistent high quality service department. Breezer designs their transportation bikes to make it as easy, simple, and fun as possible to choose your bike over your car. With an eye for that classic Dutch bike look and feel, combined with modern components and frame materials, Breezer bikes is on the forefront of both style and function. Felt bikes cannot be surpassed in quality and style. Felt makes great riding and looking bikes that stand out from the pack. With a timeless design inspired by classic European city bikes, the VERZAe S is the perfect bike for getting around town quickly and in style. The durable frame features a step-thru design, which makes it easy to mount and dismount and gives you more control and stability. Its suspension fork elevates the already comfortable ride quality, and the Shimano STePS electric pedal-assist system provides maximum range and efficiency. With the Urban Arrow electric cargo bikes, they are seeking a way to make the city a greener and quieter place. Urban Arrow makes attractive and high-quality cargo bikes that use the newest technology and state-of-the-art materials to move people and freights through town in the fastest way possible. By doing so, they aim to reduce the use of scooters and cars. Not just in the Netherlands. Their goal is to make the best cargo bikes in the world. That’s why today they are already doing business in 11 countries. 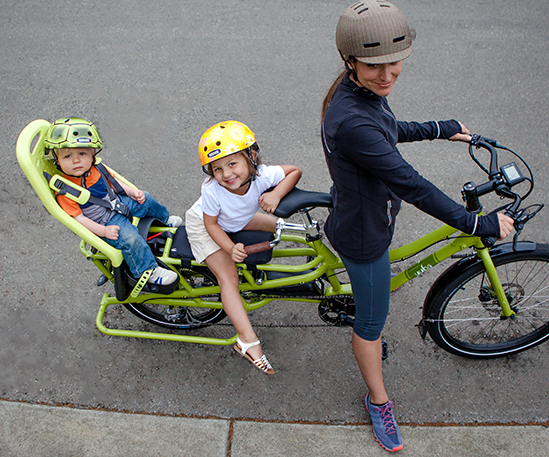 The Urban Arrow Family electric cargo bike is a bike with electric assist that quickly and safely carries your children across town. The bicycle has a lightweight aluminum frame and can be easily and smoothly maneuvered through traffic jams. From now on you can leave your car at home. What more does a family want! We have seen many different takes on this style of bike and the Urban Arrow leaves them all in the dust. Utilizing a top of the line Bosch mid drive electric system and a lightweight aluminum frame the Family is a great choice for everything from daily commutes to school to fully loaded grocery runs.